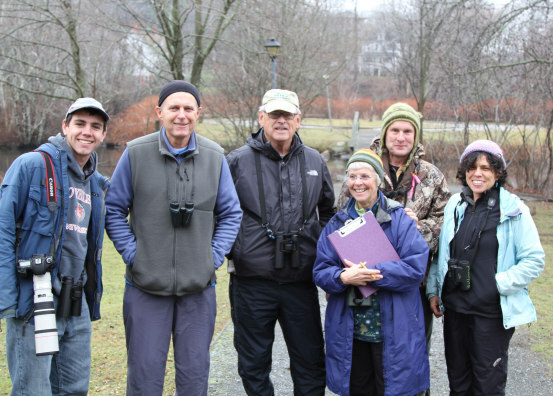 The totals are in from the Plymouth Christmas Bird Count held on December 17, thanks to compiler Trevor Lloyd-Evans of Manomet Center for Conservation Sciences. The area covered annually on this citizen science project is a 7.5-mile radius circle centered at the Pinehills, which includes ponds, beaches, forest, roadsides and backyard bird feeders. Twenty-six birders, including me, participated this year, splitting up in small groups to cover as much territory as possible. Between us, we counted 11,181 birds of 106 species. Section 1 crew (from left to right): Sean Williams, Kevin Powers, Wayne Anderson, Molly Cornell, Brad Winn, Dorie Stolley. Not shown is Liza LePage who was taking the photograph. I joined the group covering section 1, which contains Long Beach, and what a treat that was. The seven of us drove out Ryder Way to the Goldenrod field station viewing sea ducks like Surf Scoters, Long-tailed Ducks and Horned Grebes. From the field station we walked out onto the beach and soon spotted a Snowy Owl perched on a post – a thrilling way to begin the day. Other beach highlights were Snow Buntings, Horned Larks, Purple Sandpipers and Savannah (Ipswich) Sparrows. The rest of the day didn’t let us down. Splitting up, we covered the waterfront (Iceland Gull! ), Nook Road (Rusty Blackbird! ), Great South Pond, Plimoth Plantation (Common Yellowthroat!) and other birdy spots. One of my favorite sightings was at Jenney Grist Mill where we found a confused Wood Duck misbehaving with Mallards and begging for food. We also discovered two-dozen cheerful Wild Turkeys; last year we only saw their giant footprints in the snow. Being a part of a Christmas Bird Count is always fun: great birds, personable company, and fresh air. There’s also the satisfaction of contributing to a nationwide citizen science effort to document changes in population trends and ranges of birds. Why don’t you join us next year?